Squire SS50CS Stronghold Closed Shackle Padlock Squire SS50CS High Security Closed Shackle Padlock is made with a solid hardened steel body and a shackle of hardened boron alloy steel. The closed shackle design gives total protection against boltcroppers.  Cen No 4 security rating.  50mm X 26mm thick solid hardened steel body.  Vertical Shackle Clearance 16mm, Horizontal Shackle Clearance 16mm  Protection from anti-drill & slide hammer attacks.  Hardened solid steel lock body.  Hardened steel cover plate.  Hardened boron alloy 10mm shackle  6-pin anti-pick cylinder design,  Flat key 6-pin tumbler anti-pick mechanism.  Offering over 250,000 key combinations.  Anti-corrosion finish.  Solid brass cylinder. 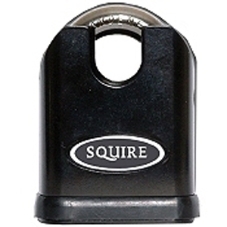  All Squire locks come with a 10 year guarantee.